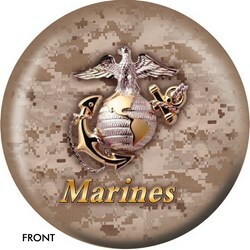 Don't miss out on this design featuring Marines Iwo Jima on camo background. Destroy the pins and the competition with this ball! My husband loves anything with the Marines on it, and I thought this would be great since he's recently picked up bowling. However, the image on the ball itself is very low quality and looks cheap. Also, there is a very obvious seamline (about half an inch across the ball) and it makes it look very ugly. Had I known that it would look this bad I never would have ordered it. 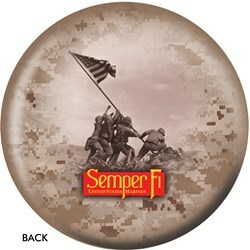 Due to the time it takes to produce the OnTheBallBowling U.S. Military Marines Iwo Jima ball it will ship in 1-2 weeks. We cannot ship this ball outside the United States.